Below is a twitter review of Dr. Christopher Emdin's For White Folks Who Teach in the Hood... and the Rest of Y'all Too. Once in awhile, I'll tweet as I read something. And sometimes, I bring those tweets into a blog post, as I've done here. For White Folks Who Teach in the Hood was published in 2016 by Beacon Press. Dr. Emdin is an Associate Professor in the Department of Mathematics, Science and Technology at Teachers College, Columbia University. He's been featured on ABC, NBC, CBS, Forbes, the Wall Street Journal, and the Washington Post. That is a lot of visibility for an education professor! That visibility is why I know who he is, and why I think it important to share these thoughts about the introduction to his book. It was his use of the word "neoindigenous" that caught my eye when his book came out. I didn't read it when it came out because I am not working as an Education professor. Looking at Emdin's FOR WHITE FOLKS WHO TEACH IN THE HOOD and wondering if anybody has read it and felt his use of children at Carlisle in the Intro is off base? Right now, it strikes me as problematic. Emdin begins with an account of having spent a day with mostly White teachers in Wyoming who teach mostly Native children who are disinterested, underperforming, not adjusting to rules of the school. The teachers, he writes, had questions, and in "an effort to not offend" he steered clear of the fact that these are White teachers, teaching Native children. He offered strategies that he knew, from experience elsewhere, that might help. Later, he reflected that the teachers might have gotten insight about the profession of teaching, but wasn't sure if they knew or cared abt divide between schools and unique culture of the students. Then, he remembers Luther Standing Bear's MY PEOPLE THE SIOUX and starts to make connections between "Indigenous Americans and the urban youth of color in my hometown." This is where Emdin tries to make connections between students at Carlisle in the 1870s--specifically drawing from the writings of Luther Standing Bear--and his own days as a youth in East Flatbush, Brooklyn, and in the Bronx. And that's where things really start to feel... off. 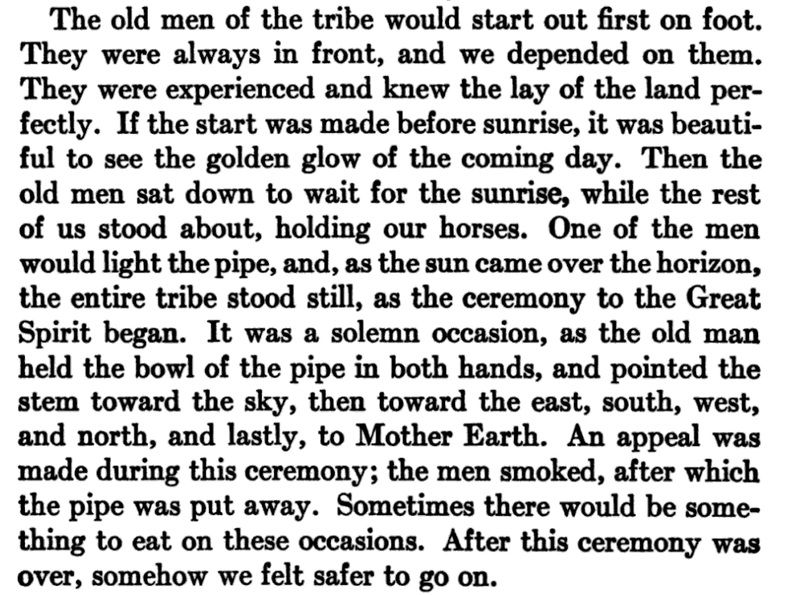 Standing Bear wrote abt a Sioux elder's actions to commemorate a death. It reminds Emdin of men in his urban neighborhood who would lift liquor in brown paper bags to the heavens, to commemorate someone. 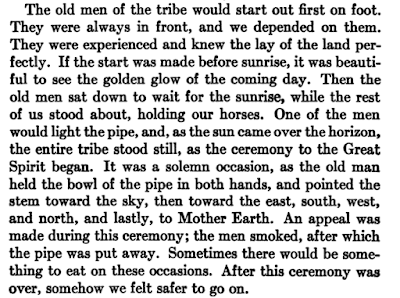 Rdg what Standing Bear wrote helped Emdin understand what those men were doing. It was, he writes, a powerful community practice around sorrow and healing. I understand how he got there but was that lifting of liquor in brown paper bags rooted in a system of religion? Then, Emdin shifts to Carlisle and Pratt and teachers who went there. The teachers, he writes, believed in Pratt's vision: "For them, it was because of Pratt's genuine concern for the Indigenous Americans that he had found it in his heart to give them a better life through education." Emdin takes care to be critical of methods at Carlisle, like when he uses quotes around "tame the Wild Indian" where he writes that the school was an experiment to "tame the Wild Indian." He writes that the school used a militaristic approach (it did) to help "the Indigenous Americans assimilate to white norms." This meant stripping them of their culture and traditions. He's right about that, too, but it is a VERY incomplete way to think of the schools. I think Emdin is wrong to use Luther Standing Bear and Carlisle Indian Industrial School as a launching point for his book. Without any mention of sovereignty and treaties, he's inadvertently doing what Pratt did. I think Emdin must not know about our status as sovereign nations. That is a huge problem throughout the US. People generally don't know. They see us as peoples with cultures, or one of the "multicultural" populations in the US. At the bottom of page 7 is a new section in the intro, titled "Connecting the Indigenous and Neoindigenous." Emdin starts by talking abt the UN Declaration on the Rights of Indigenous Peoples and hones in on geographic location prior to colonization/invasion. He says "unique knowledge" but nary a mention of our status as nations. UNDRIP references our political structures and treaties. Did Emdin see that? Then he focuses on "Indigenous American students" at Carlisle. I think his use of that phrase signals a lack of understand of what it means to us to be sovereign nations. Students who went to Carlisle were citizens of their nations. Some Native peoples--then and now--foreground their status as citizens of their Native nation. If a nation doesn't have citizens, it ceases to exist as a nation. On page 8, Emdin says that if you remove the geographic location from the UN Declaration, "it can be applied to marginalized populations generally." Again--I see what he's doing but this does not work! He says "Because of the similarities in experience between the indigenous and urban youth of color, I identify urban youth as neoindigenous." It is the way he wants to use that word -- Indigenous -- that gets very messy. Indigenous children are citizens of Indigenous sovereign nations. Urban youth and urban communities do not have that political status. It might also be helpful to think of where Indigenous Studies departments are located, within universities. Usually, they are part of ethnic studies configurations but placing them there obscures that nationhood status. Someone---Dr. Duane Champagne, maybe--made the point that perhaps it would help if Indigenous Studies departments were housed with International Studies, instead. I'd have to look for it to be sure, but I think he made that observation in "Native American Studies in Higher Education: Models for Collaboration between Universities and Indigenous Nations (Contemporary Native American Communities) published in 2002. Hmm.. the photo I took today of my nation's flag makes that point. 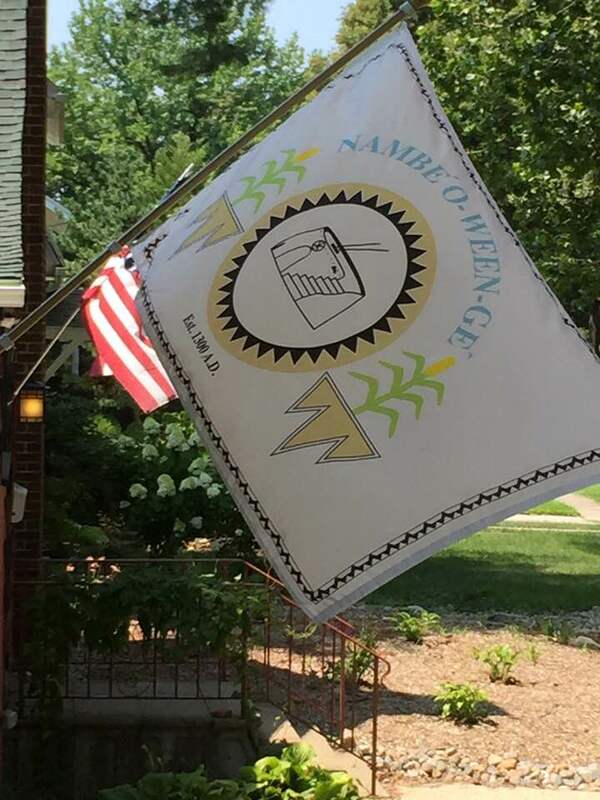 Our neighbor is flying the flag of the US. I'm flying the flag of Nambé, which is a nation, too. I'm also curious about the binary that Emdin seems to be working with. If I understand what he's saying, neoindigenous means black urban youth. But... I know for a fact that many of them are citizens of Indigenous nations, too. And within cities like Chicago, Los Angeles... you'll find sizable Indigenous communities, there because of one of those govt assimilation projects. That one is Relocation, of the 1950s. Some info here: American Indian Urban Relocation. Back to Emdin's intro. On page 13, where he writes "the indigenous, who have been relegated to certain geographic areas" -- well, why say "relegated"? That carries a less-than connotation. Some of us are on our homelands. We didn't get "relegated" to them. For sure, Emdin is making good pts abt how youth are treated in schools and I understand his goal is to get teachers to think abt the cultures their students have as a plus--not a minus--but along the way, he's kind of passing along errors re Indigenous peoples. End of thread on August 3rd. If you think I ought to be quiet about these problems, then, you're asking me to be complicit in the misrepresentations of Native peoples. I won't do that. My ancestors fought for our existence. Because of that, I am here, today. We are here, today. As nations. Emdin could have built his concept of reality pedagogy without using Indigenous, or neoindigenous. At one point in the thread on August 3rd, @arcticisleteach replied to me, tagged Emdin, and suggested I include Emdin in the twitter conversation because they are sure Emdin would be open to the dialogue. Emdn replied, saying "Absolutely. Always here to discuss the work. Let's get it!!" Appreciate your perspectives & thoughtfulness. I certainly could have avoided neoindigenous framing. It was intentional not to. Paying homage? Homage and honor .... that's the sort of thing that got mascots on sports fields. And our "but my focus" sounds a lot like white folks who defend the mascots with "but you don't understand! I'm trying to honor you!" And he responded at 8:01 AM, saying "Elders I spoke w/ for permission & blessing before moving forward with my work would disagree w/your perceptions of my intention"
Ah. Invoking elders. That's kind of messed up. It is a given that you have the very best of intentions. But lets be real, ok? Some elders are ok with mascots. You and I are working in Education. We know what representation is all about. I am pointing out problems that I see in your use of boarding schools and Luther Standing Bear and the term "neoindigenous". Because you're very successful with this book, it is influential and shaping the way that teachers are thinking. That they're getting wrong info about Native people from you is not good. At all. If the shoe was on the other foot, I think you would agree with me. You said: "Elders I spoke w/ for permission & blessing before moving forward with my work would disagree w/ your perception of my intention"
I would like to know more about what precisely you said to these elders. What did you need permission and blessings, to do? I'm pushing pretty hard, and I know that seems mean to some and uncomfortable to others. In my look-see at what you used from Standing Bear, you have it wrong. But maybe I'm wrong. Can you tell me what page to look at in his book? Dr. Emdin has not replied. When he does, I'll be back to insert his response. And maybe it doesn't feel right to him to try to use Twitter for this conversation? If that's the case, he's welcome to say more, here. I'll let him know when I share this post on Twitter. Part of why I have chosen to turn that Twitter review into a blog post that incorporates his responses is that I think it is helpful to students--whether they're young children or adults in college--to see scholars talking to each other, wrestling with ideas, and maybe revising our own in the process. I don't know if what I've said above in the tweets makes sense to you. If not, let me know in a comment or on Twitter. I could turn the questions into a Q&A that I can add to this post. "Okay, first things first; I know Emdin is not white. I mention this up front because I've been accused in the past of bringing up white supremacy in conversations where people somehow don't think it belongs because the person I'm talking to/about isn't white. Intersectionality is so important. And I find that people tend to be highly reductionist in their thinkings about marginalizations, particularly about those marginalizations they do not share. And that reductionism has its roots in white supremacy. White supremacy can affect even those whom that ideology marginalizes, because we are all divided away from knowing about others and ourselves, all in favor of knowing about what white supremacy would have us know. One of the things it took me years to learn is both how marginalizations are different and how they intersect. And I'm still learning that. And I'm reminded that this is something everybody will just keep on learning---if they allow themselves to do so. White supremacy would have us believe that non-white people can be substituted like so many pegs in round holes interchangeably. This is not the case and we all must learn not to do this. It's just really hecking weird to realize that, at this point in time, Emdin knows less about this than I do. I would prefer this to not be the case, because lots of people sure don't listen to me and I'm extremely vulnerable to harassment and online abuse. I super don't want to make this comment but I am because I'm under the misguided optimism that this comment might make a difference. I apologize for the anonymity."